I will be visiting Paris in a couple of days. I was wondering what is the cheapest way to visit all the major tourist attractions in Paris? Do they have 3-day passes for all the public transportation (bus-metro-train) or is it cheaper if I buy tickets when I use them? The metro is €1,90 per ride, and if you buy a carnet of 10 the price is €14.50 for all 10. Probably your best bet. I hate cycling because of the issues with locking it up, worrying about theft, and if you're in the upper arrondissements going uphill on cobblestone sounds like a miserable experience I would rather spare myself from. The city is surprisingly small, with a most of it very walkable (especially the major tourist attractions). Over three days I imagine 10 tickets is more then enough for the two of you. 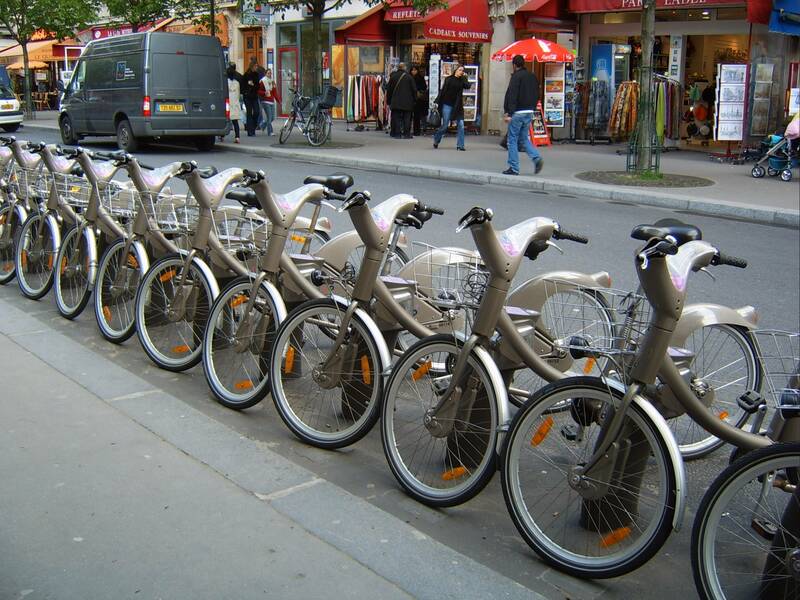 The cheapest, but especially most efficient way of transport to get around Paris is the Velib. You pay a fee of 1,70 EUR for a dayticket or 8 Eur for a week ticket. During the validity of this ticket you can use any bicycle from the velib network. The catch to really travel cheap is to change bikes every 30 minutes. If you cycle more then 30 min you will have to pay an additional fee, which gradually increases the longer you cycle. When you change bikes within 30 minutes you don't need to pay an additional fee. It is also quite efficient. Paris is a huge city, but in terms of km it is not such a big city (as long as you consider Paris to be bordered by the Boulevard Peripherique. So within 30 minutes you can cycle easily between the major highlights within the triangle Notre Dame, Eiffel tower, Sacre Coeur). Doing this in the same time frame with public transport is more challenging. You can buy your tickets at every velib terminal, but personally I prefer buying them online. It takes a little time to get into the habit of selecting a bicycle, but once you have selected 2 bicycles it is plain simple. Cheap + Efficient = Walk! Paris "intra muros", i.e. the area inside the ring road (boulevard périphérique, postal codes starting with 75) is relatively small. It has a surface of 105 square kilometers. On the North-South axis the largest distance is 10 kilometers and on the East-West 12 kilometers. These distances are rough estimates but give you a good idea of the size. Thus if you stay in Paris "intra muros", and if you plan your sightseeing efficiently, you can do a lot by walking. If you are tired or if you want to proceed faster, use the public transport, as described in the other answers. The bicycle rental (Vélib) is another cool and interesting alternative. However, if you want it to be cheap and effective you have to you use it more than once a day. Otherwise you can use the Metro or the bus for the same price (1.70 EUR). If you are consider Vélib, note that although Paris "intra muros" is rather compact, it is far from being flat! The Vélibs are not fancy lightweight cycles but 20+ kilogram ploughs with only three speeds. They are meant to be robust. In my opinion, public transport tickets for several days, like the "Paris visite" are hardly worth the money, unless you are heavily using the Metro. A carnet of 10 tickets (13,30 EUR) is usually more interesting. A last word on effectiveness. If you decide to take the public transport, prefer the bus to the metro whenever feasible. Contrary to the Metro, buses are always running on the surface and you will get to see a lot of Paris that way. Take the Metro. Better than a carnet if you plan to ride often, I suggest you consider unlimited-ride passes. These give a sense of freedom, "need a ride? let's go!". You an use the underground network as well as buses and light rail. Paris Visite : The tourist thing. Rather expensive, with a booklet of vouchers for museums and such. Mobilis : what the locals use when occasionally need a day of travel. Much less advertised but cheaper. Cover same as Paris Visite, minus airport access using Orlyval and RER B and you don't get the vouchers booklet. Ticket Jeunes : weekends and state holidays only, for people under 26. Very good value. On a longer term, there is the Navigo for the week, but it's forced to be from Monday to Sunday. When you buy a pass, you have to choose the zones of validity; there is a minimum of 2 zones. Zones 1 will allow you to see all Paris. In the suburbs, you may add zone 3 to see La Défense and zone 4 to visit Versailles. Many attractions are located on Metro line 1. The line was converted to driverless operation during the previous year and is very reliable; there is a fun view in the front of the trains. Not the answer you're looking for? Browse other questions tagged budget trains public-transport paris or ask your own question. Can a single 'OV-chipkaart' be used for multiple people from Eindhoven to Amsterdam, and then locally in Amsterdam?